Now I love the third-generation Honda Civic. At this point I have owned at least a half-dozen '84-'87 Civics; they're quick, soldier on for 300,000+ hassle-free miles, and parts are easy to find. But I will never own another carbureted 3G Civic, not since the Smog Overlords imposed the dyno-based Smog II testing standard on Northern California. 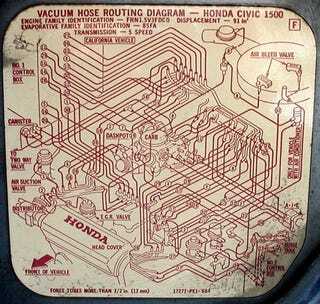 The CVCC engine, with its double combustion chambers, requires thee most complicated rat's nest of vacuum hoses, solenoids, dashpots, and sensors I've ever had the misfortune to tear into (see the underhood sticker in the photo, above; that's a simplified diagram for an '85 Civic), in order to make the car meet emissions standards. And if any component of the rat's nest is leaking or malfunctioning, the car will fail the smog check, and woe be upon the sucker who attempts to locate the problem (is it the sensor that tells the computer the car is above 6,000 feet? the one that detects half-throttle deceleration in third gear? the one that checks for unusual sunspot activity? ).